The holidays are finally here, and with it comes a lot of food, a lot of relaxation, and for many a lot of unwanted weight gain. But, this year doesn’t have to be like every other one. In fact, you can actually keep fat gain to a minimum while still indulging a bit here and there with these holiday diet tips. High intensity interval training (HIIT) as well as heavy resistance training relies primarily on glycogen, the stored form of carbohydrates in muscle. Performing a bout of HIIT or heavy lifting prior to feasting helps deplete glycogen stores, creating a “carb sink” of sorts. What this means is that any carbohydrates you eat (stuffing, mashed potatoes, cookies, etc.) will first be used to replenishing muscle glycogen, and only after they are full can carbohydrates possibly be converted to fatty acids and then stored as fat. So, if you want to have your cake and eat it too, make sure to get in a hard-hitting HIIT session right before sitting down to eat. If there’s one macronutrient you want to load up on this holiday season, it’s protein. Your body is literally made of the stuff. But there’s more, protein is also highly satiating and very thermogenic. What this means is that not only does protein help fill you up, but your body must also expend greater amounts of energy (i.e. calories) to digest protein than either carbohydrates or fats. When it comes to epic holiday feasts, most often the extravagant meals occur around lunch or dinner. Skipping breakfast allows you want to “bank” some calories so that should you indulge a bit too much during the main meal, you’ll have some “wiggle room” with your calories due to skipping breakfast. 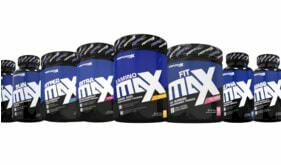 FitMax provides a delicious option to boost metabolism and suppress appetite. It contains a synergistic matrix of compounds that help increase calorie expenditure and fatty acid oxidation, aiding your quest to stay on point with your diet no matter how many tasty temptations cross your path.